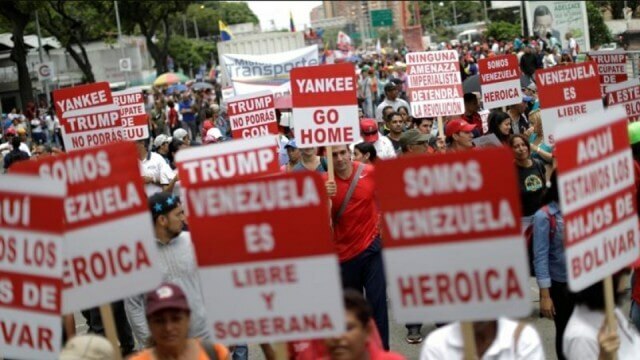 Under the Trump administration, aggressive rhetoric against the Venezuelan government has ratcheted up to a more extreme and threatening level, with Trump administration officials talking of "military action" and condemning Venezuela, along with Cuba and Nicaragua, as part of a "troika of tyranny". Problems resulting from Venezuelan government policy have been worsened by US economic sanctions, illegal under the Organization of American States and the United Nations - as well as US law and other international treaties and conventions. These sanctions have cut off the means by which the Venezuelan government could escape from its economic recession, while causing a dramatic falloff in oil production and worsening the economic crisis, and causing many people to die because they can&apos;t get access to life-saving medicines. Meanwhile, the US and other governments continue to blame the Venezuelan government - solely - for the economic damage, even that caused by the US sanctions.